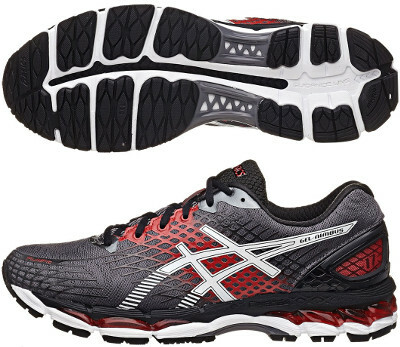 Asics Gel Nimbus 17 are neutral cushioned running shoes. The Asics Gel Nimbus 17 is the latest upgrade of one of the most popular shoe among those runners enjoying high mileage, plush cushioning and premium materials. Initially targets neutral foot strikers and removable insole let you use your custom one. The Nimbus 17 features a completely new upper from its predecessor the Nimbus 16. Now it is a one piece of lightweight breathable mesh with high density printing to produce a modern and attractive design. Heel counter provides extra support for a more secure stride and also improves visibility under poor light conditions. ComforDry X-40 not only enhances interior's dealing with odour and moisture but also increases comfort with softer feel. The other major change in the Nimbus 17 is a softer cushioning feel based on FluidRide™ midsole evolution already present in its well known stability relative the Kayano 21 which reduces weight by 15% and enhances rebound properties by 20%. More and more Gel© can be found in both forefoot and heel pads to improve cushioning, it seems there was not enough. This new version also takes advantage of the AHAR+ rubber which is placed in critical areas of the outsole for exceptional durability.